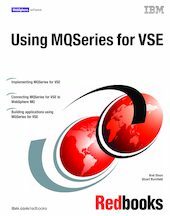 This IBM Redbooks publication will help you get started with MQSeries for VSE V2R1.2. It explores why and how to use MQSeries with the VSE operating system and shows why MQSeries is more than just another queuing system. This book is meant for those who know VSE but have only a slight understanding of MQSeries and how to use it. This book contains an overview of the MQSeries installation and configuration, explains how to connect clients to servers and servers to servers, how to trigger applications, and the MQI programming interface. It describes the command interface, how the libraries are used, and how to edit, compile, test, and debug a program. This book also provides information about performance and security for the MQSeries for VSE V2.1.2. It explains what has to be done to use MQSeries for communication between VSE and other platforms, such as OS/390 and Windows XP. Examples are given to guide the user through the administrative process of defining connections between different systems, and information regarding security, backup, and recovery is also provided.